The beneficial effects in lipid profiles after obesity surgery might be associated with the decrease in cardiovascular risk. However, direct comparison between different surgical techniques has not been extensively performed. In the present study we compare 20 obese women submitted to laparoscopic Roux en Y gastric bypass (RYGB) with 20 women submitted to sleeve gastrectomy (SG). Twenty control women matched for age and baseline cardiovascular risk were also included. Both patients and controls were followed up for 1 year after surgery or conventional treatment with diet and exercise, respectively. Lipid profiles were measured at baseline, 6 and 12 months later. Carotid intima-media thickness was measured by ultrasonography at baseline and at the end of the study. Women submitted to bariatric surgery showed a decrease in total cholesterol, triglycerides, oxidized-LDL and ApoB, and an increase in HDL and ApoA concentrations that occurred regardless of the surgical procedure. LDL concentrations, however, decreased only after RYGB whereas Lp(a) showed no changes. We did not observe any correlation between the changes in serum lipid concentrations and those in carotid intima-media thickness. Sleeve gastrectomy and gastric bypass induce a similar beneficial effect on serum lipids in women with high cardiovascular risk 1 year after surgery. Obesity, a major public health issue  is associated with an increase in mortality and many comorbidities [2, 3]. The latter include several cardiovascular risk factors such as type 2 diabetes, dyslipidemia, hypertension, and prothrombotic states, among others [4, 5]. The use of obesity surgery procedures has increased steadily in the past decades because such procedures characteristically result in much larger long-term weight loss than that usually achieved following diet and life-style modification . This tendency has also been driven by the low complications of modern laparoscopic surgical procedures that, although not free of nutritional and metabolic issues [7–10], clearly compensate for the substantial long-term morbidity and mortality of severe obesity . The remission of many metabolic and hormonal disorders [12–16] and the reduction in cardiovascular risk are also superior with obesity surgery [17, 18]. Focusing on the pro-atherogenic lipid profile, weight loss of at least 5% may result in a decrease in all apolipoprotein B (ApoB)-containing lipoproteins and an increase in the circulating concentrations of large high density-lipoprotein (HDL) particles . Besides, the marked weight loss that usually follows bariatric surgery also ameliorates the atherogenicity of plasma lipoproteins by reducing the ApoB-containing lipoproteins and oxidised low density-lipoproteins (oxLDL), as well as by increasing the HDL-2 subfraction . We have recently reported that both Roux-en-Y gastric bypass (RYGB) and sleeve gastrectomy (SG) induced a decrease in carotid intima-media thickness that was superior to that attained after medical treatment . We also found an increase in HDL concentrations after bariatric surgery regardless of the surgical technique applied, whereas LDL levels only decreased after RYGB. Although the latter might be considered as an advantage of RYGB over SG in terms of decreasing cardiovascular risk factors, an expanded analysis in lipid profiles are necessary before reaching such a conclusion. Therefore, in the present study we report an expanded analysis of circulating lipids after both RYGB and SG. As it will be seen, the beneficial effects observed on circulating HDL, apolipoprotein A1 (ApoA1), ApoB and oxLDL were of similar magnitude after both surgical techniques. We included 40 women submitted to obesity surgery who met the criteria for the metabolic syndrome  and, hence, had a high cardiovascular risk. The Systematic Coronary Risk Evaluation (SCORE) – a validated and recommended method for estimating cardiovascular risk in Spanish population  – was also calculated for each patient and control at baseline. Half of them were submitted to laparoscopic RYGB and half were submitted to SG following international guidelines for obesity surgery and our hospital’s own protocol. This local protocol allocates patients with body mass index (BMI) above 45 Kg/m2 preferentially to RYGB - although patients with BMI > 45 Kg/m2 were not excluded for a SG procedure - and, therefore, it precluded randomization of the subjects for the surgical technique finally applied. Other than BMI, no other characteristic of the patients influenced the allocation to RYGB or SG. Previous diagnosis of type 2 diabetes mellitus and hypertension followed current international standards [24, 25]. The main characteristics of RYGB procedure include a 20–40 ml gastric pouch, a biliopancreatic limb measuring 80–100 cm from Treitz ligament, and a 120–200 cm-long alimentary limb. SG was performed with a laparoscopic linear stapler calibrated with a 32F orogastric tube. Twenty control women matched for age and cardiovascular risk were also recruited and submitted to treatment with diet and life-style modification. Exclusion criteria included mental impairment, uncontrolled psychiatric conditions or active substance abuse, active neoplastic disease, pregnancy, unstable or incurable serious pre-existing comorbidities, and current treatment with thiazolidinediones. Both patients and controls were evaluated at baseline and 1 year after surgery or after starting conventional treatment with diet and life-style modification, respectively. Patients were also revaluated 6 months after surgery for anthropometric and analytical evaluation (but not for carotid intima-media measurements). Data of the change in carotid intima-media thickness of these patients were reported earlier . Basal blood samples were obtained in every woman after an overnight fast. Office blood pressure, waist circumference (WC), weight and height were also recorded and BMI calculated. 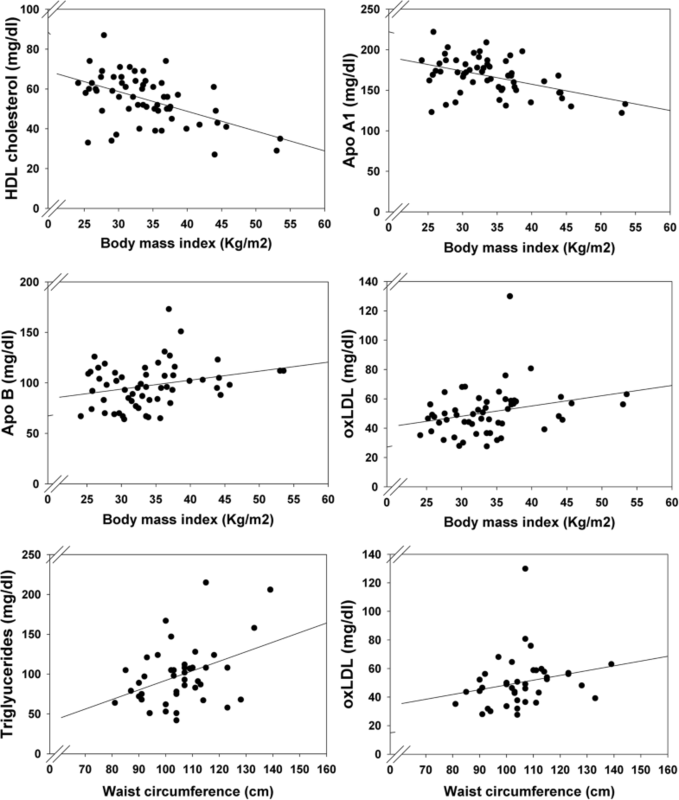 Excess body weight (EBW) was calculated as baseline body weight minus the ideal weight [26, 27]. Excess weight loss (EWL) was calculated as the percentage of weight loss from baseline EBW. Control women were prescribed a modified Mediterranean diet, aimed to a caloric restriction of 400–500 kcal per day, by an expert dietitian. Patients attended bimonthly interviews with the dietitian for nutritional counseling and follow-up during the study period. For those women submitted to obesity surgery, a 1400 kcal per day preoperative diet was prescribed two to 3 months before the intervention and, during the first month after surgery, a transition liquid to solid diet was supervised by a dietitian. A fractionated diet with 5 to 6 mixed meals was then prescribed throughout the study period. Levels of fasting HDL cholesterol were measured in supernatant after plasma precipitation with phosphotungstic acid and Mg2+ (Boehringer Mannheim GmbH, Mannheim, Germany). Levels of total cholesterol and triglycerides were measured by enzymatic methods (Menarini Diagnostica, Florence, Italy). The LDL cholesterol level was calculated by using Friedewald’s formula. OxLDL was measured in duplicate by enzyme link immunosorbent assay (ELISA) in fresh EDTA plasma samples using a commercial kit (Mercodia Oxidized LDL ELISA, Mercodia Uppsala, Sweden) with a detection limit of 0.6 mg/dl, and an intra- and interassay CVs of 6.3 and 4.7% respectively. Serum lipoprotein a [Lp(a)], apolipoprotein A1 (ApoA1), and ApoB levels were measured by standard colorimetric methods, using the Architect ci8200 analyzer (Abbot Diagnostics, Berkshire, UK). The Lp (a) assay had a detection limit of 0.83 mg/dl, an intrassay CV of 0.7% and an interassay CVs of 1.9%. Intra- and interassay CVs were 1.4 and 0.7% for ApoA1 and 2.3 and 1.5% for ApoB, respectively. Detection limits for both apolipoproteins were < 3 mg/dl. A priori power analysis was performed as reported before . Results are expressed as means ± SD unless otherwise stated. The Kolmogorov–Smirnov statistic was used to assess normality. Logarithmic or square root transformations were applied if needed. One-way analysis of variance followed by Dunnet’s or Tuckey’s tests was used to compare the central tendencies of the different groups. For non-parametric variables Kruskal-Wallis test followed by Mann-Whitney U tests were employed. For discontinuous variables we used the χ2 test and Fisher’s exact test. Comparisons of continuous variables before and after surgery were performed using repeated-measures general linear model (GLM) analysis, and the group of subjects (controls, RYGB or SG) was introduced as the between-subjects effect. The comparison of the magnitude of the changes in the dependent variables during follow up (calculated as the percentage increment from baseline) were performed by one-way analysis of variance (ANOVA) followed by posthoc analyses (Dunnet’s and Tuckey’s tests) or by Kruskal-Wallis and Mann-Whitney U tests as appropriate. Bivariate correlation was employed to study the association between two continuous variables using Pearson’s tests. Analyses were performed using SPSS 17 (SPSS Inc., Chicago, Illinois). P < 0.05 was considered statistically significant. The baseline characteristics of the patients are summarized in Table 1. As expected from our surgical protocol, patients submitted to RYGB presented with increased BMI, EBW, and WC (Table 1). We did not observe differences in lipid profiles, blood pressure or percentage of smokers between the groups (Table 1). On the other hand, the number of patients on statins were higher in the group submitted to RYGB than in the groups treated with SG diet and life-style modification (Table 1). The cardiovascular risk measured by the SCORE was high (5–9% at 10 years) in all patients except for one control, one patient submitted to SG and one patient submitted to RYGB, all of whom showed very high risk (> 10% at 10 years). Compared with non-surgical controls who showed no significant changes in lipid concentrations at the end of the study (Fig. 1), women submitted to bariatric surgery experienced a decrease in total cholesterol, triglycerides, oxLDL and ApoB, and an increase in HDL and ApoA1 concentrations (Fig. 1). The latter changes were similar after sleeve and RYGB, but serum LDL cholesterol decreased only after RYGB (Fig. 1). On the other hand, serum Lp(a) showed no changes in any group (Fig. 1). Regarding other clinical and analytical variables, a greater EWL and a decrease in BMI, WC and blood pressure were observed after bariatric surgery with no influence of the surgical technique (Table 2). Similarly, carotid intima-media thickness decreased in patients after surgery regardless of the surgical technique but did not change in controls (Table 2). The number of patients on statins was reduced only after RYGB (2, 3 and 3 patients were on statins in the RYGB, SG and control groups at the end of the study, respectively). When considering all participants as a whole (both women submitted to surgery and those to diet and exercise), there were no correlations between the changes in carotid intima-media thickness and those observed in any of the lipids analyzed (Table 3). Correlations were no significant either when repeating the analysis separating patients into subgroups of surgery and controls (data not shown). At the end of the study BMI showed a negative correlation with HDL (r = − 0.516, P < 0.001) and ApoA1 (r = − 0.462, P < 0.001), and a positive correlation with triglycerides (r = 0.499, P < 0.001), ApoB (r = 0.265, P = 0.046) and oxLDL (r = 0.277, P = 0.040) (Fig. 2). Also, WC showed a positive correlation with triglycerides (r = 0.399, P = 0.009) and oxLDL (r = 0.367, P = 0.020) (Fig. 2). Our results show that the pro-atherogenic lipid profile characteristic of women with severe obesity and the metabolic syndrome turns into a healthier one after bariatric surgery, with a significant increase in HDL and ApoA1, and a decrease in LDL, oxLDL and ApoB. Except for the decrease in LDL which was of a higher magnitude after RYGB, the overall effects on lipid profile was of a similar magnitude after both surgical techniques. However, we could not demonstrate an association of these changes with the decrease in carotid intima-media thickness. In humans, adipose tissue stores about a quarter of total body cholesterol whereas in obese individuals this figure is increased up to 50% . Furthermore, a high cholesterol content is also found in muscle, skin and connective tissues with increased body fat . This accumulation of cholesteryl esters is essential for atherosclerotic plaque formation, as well as for the rupture of vulnerable plaque that results into cardiovascular events . Consequently, the important weight loss achieved by bariatric surgery reduces the risk of myocardial infarction, stroke, cardiovascular events and cardiovascular mortality compared to non-surgical controls . Even though not every patient with severe obesity shows what has been called a “metabolically unhealthy obese phenotype” , when present, the mixed dyslipidemia associated with obesity is characterized by increased triglycerides, LDL and oxLDL and an increased proportion of smaller and atherogenic LDL particles, as well as reduced HDL concentrations [32, 33]. Dyslipidemic patients with obesity may experience a beneficial change in their lipid profiles after weight loss, including bariatric surgical procedures. It typically reduces triglyceride levels and often increases HDL levels, also with a decrease of triglyceride-rich lipoproteins and a decreased in LDL particle number with a decreased proportion of smaller LDL particles . OxLDL are proatherogenic lipoproteins that are thought to result from the oxidation of small, dense LDL particles . 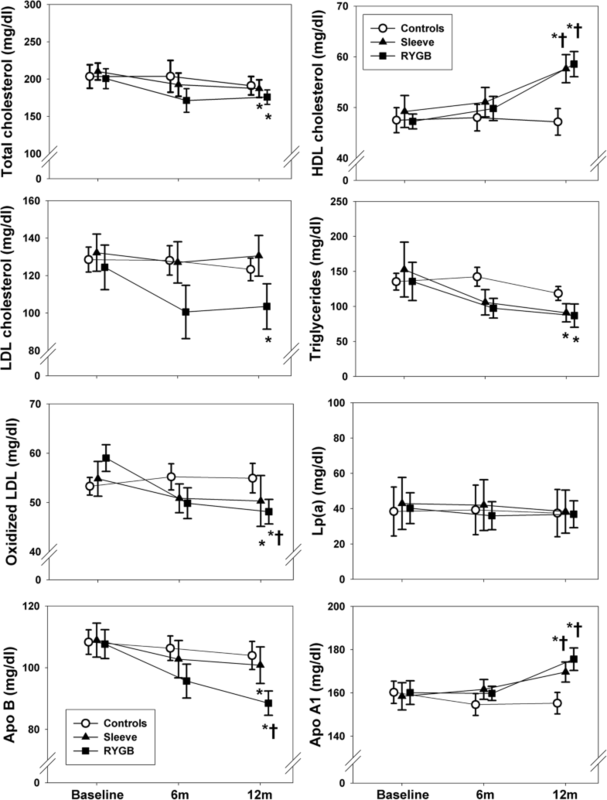 Increased adiposity in obese subjects contributes to low-grade inflammation  and global oxidative stress by increasing the production of reactive oxygen species . Conversely, bariatric surgery induces a reduction in inflammation  and oxidative stress [36, 38], decreases plasma oxidative markers, including oxLDL and Lp-PLA2 activity . Our present results expand the already published effects of bariatric surgery on circulating lipids by conducting a direct comparison of these outcomes in subjects submitted to different bariatric surgery techniques. In this regard, we here show that SG and RYGB are very similar in terms of eliciting beneficial changes in lipid profiles 1 year after the intervention. Yet, despite occurring in parallel to a reduction of the carotid intima-media thickness in these patients, the beneficial changes in the lipid profile were not associated with the decrease in carotid intima-media thickness already reported . Together with weight loss, there are several possible mechanisms that may contribute to explain why bariatric surgery may reduce CV events apart from the effects on lipids: a reduction of visceral fat, a reduction of white blood cells, and probably more importantly the decreased levels of serum molecules mediating endothelial dysfunction and inflammation . We have recently shown that the increase in adiponectin concentrations achieved after bariatric surgery drives many beneficial metabolic changes but shows no association with the decrease in carotid intima-media thickness . It is also possible that, in the short-term, the amelioration of inflammation could be a more relevant factor in decreasing the cardiovascular risk than other beneficial metabolic changes - including lipid changes - but that on the contrary, in the long term, the resolution of diabetes, hypertension and dyslipidemia might be more relevant. Furthermore, the effects of bariatric surgery on glucagon like peptide 1 (GLP-1) concentrations, which have been shown to be of a different magnitude after RYGB and SG , may also explain in part the differences between these two surgical techniques on lipid profiles. Future long-term studies should address these issues. Our study has several advantages such as being based on a homogeneous population in terms of age, baseline cardiovascular risk and a strict follow up of patients submitted to obesity surgery. Besides, by including only women, we avoided the possible interference of sexual dimorphism on metabolic function and cardiovascular risk . However, the lack of randomization in the allocation of the patients to the different interventions represents a major limitation. Non-random allocation biased adiposity and use of statins towards higher magnitudes in the subgroup of patients submitted to RYGB. Another limitation of our study is that sample size analysis was performed to find differences in carotid intima-media thickness and not in lipid profiles, so we cannot exclude the possibility of a higher efficacy of RYGB than sleeve. In fact, the proportion of patients who could stop statins was higher after RYGB than after sleeve, and this is also a positive effect of the former. Two recent studies have compared the effects on lipid profiles after RYGB and SG: Heffron and coworkers showed a similar weight loss after these two surgical techniques but a higher increase in HDL and ApoA after SG ; on the other hand, Maraninchi and coworkers also showed a similar weight loss after these two surgical techniques, with similar increases in HDL and reductions in triglycerides, but they showed a higher decrease in total cholesterol, LDL and ApoB after RYGB . Although the effects of bariatric surgery on lipid profiles are clearly beneficial, small differences between surgical techniques need further studies due to small discrepancies which may be due to different selected populations and sample size of studies. In conclusion, both RYGB and SG induce a significant increase in HDL and ApoA1, and a decrease in LDL, oxLDL and ApoB, in women with severe obesity and a high cardiovascular risk defined by the presence of the metabolic syndrome. We thank the nurse staff of the Department of Endocrinology and Nutrition for their help with the anthropometric and blood sampling of the patients. Supported by Grant FIBioHRyC EM03/2010, and grant SAF2015-70747-R from the Ministerio de Economía y Competitividad, Plan Estatal de Investigación Científica y Técnica y de Innovación 2013-2016 and cofinanced by the European Development Regional Fund, ERDF, and the Program ALIBIRD-CM S2013/ABI-2728, Comunidad de Madrid, Spain. CIBERDEM and CIBEROBN are initiatives of Instituto de Salud Carlos III. All data generated or analyzed during this study are included in this published article. Any additional information is available from the corresponding author on reasonable request. The authors have made substantial contribution to the conception and design of the study (JIB-C, MAL, HFE-M, JAB), or acquisition of data (JMG-M, EA, MC-A, MR, GD-P) or analysis and interpretation of data (JIB-C, MAL, HFE-M, JAB), drafting the article (JIB-C, JAB) or revising it critically for important intellectual content (MAL, HFE-M), and approved the final submitted manuscript (JIB-C, MAL, HFE-M, JAB, JMG-M, EA, MC-A, MR, GD-P). All authors read and approved the final manuscript. The present study was approved by the local Ethics Committee (Hospital Universitario Ramón y Cajal, Madrid, protocol number P2011/0022) and written informed consent obtained from every participant.